$49.56 Winco FFC-375 French Fry Cutter 3/8"
$201.74 Vollrath 47713 French Fry Cutter 3/8"
$201.74 Vollrath 47715 French Fry Cutter 9/32"
$264.00 Nemco 55450-2 Easy FryKutter 3/8"
$264.00 Nemco 55450-3 Easy FryKutter 1/2"
$1,772.65 Nemco 56455-2 Monster Airmatic FryKutter Square Cut 3/8"
$1,772.65 Nemco 56455-3 Monster Airmatic FryKutter Square Cut 1/2"
$58.99 Royal ROY FC 3/8 Stainless Steel Potato Cutter 3/8"
$66.99 Crestware FFC38 French Fry Cutter 3/8"
Save time on food prep in your commercial kitchen when you use the TigerChef French Fry Cutter 3/8" with Suction Feet and Cleaning Brush to prepare perfectly sized, fresh-cut French fries in bars, restaurants and cafes. 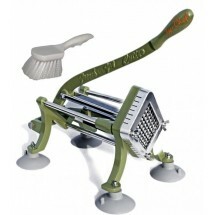 Efficient and durable, this French fry cutter features a heavy duty cast iron body, rust-proof frame and stainless steel reciprocating rod to cut whole potatoes into uniform slices with a simple lever-action movement. Simply place the potato or other vegetable, such as sweet potato, into the v-shaped trough between the blade and pusher block, pull down on the lever, and voila, perfect fries in seconds. 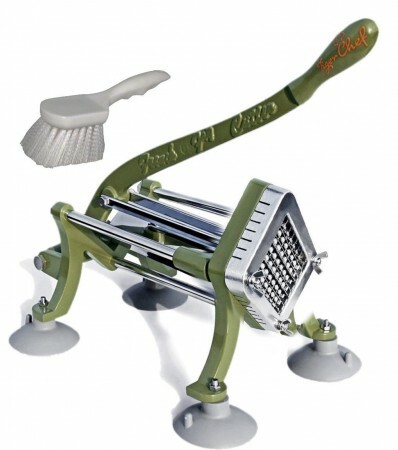 Safe to use and easy to assemble and disassemble, this French fry cutter is interchangeable with other TigerChef blade assemblies and pusher blocks (sold separately) so you can quickly change the size of the blades as desired. Designed to endure years of commercial use, this cutter features easy to attach suction feet, so it can be moved around your commercial kitchen as needed, or you can use the screw holes on its legs to permanently mount it to a wall or table top.